For those of you who’ve been looking to improve your team collaboration, this is going to be a great day. 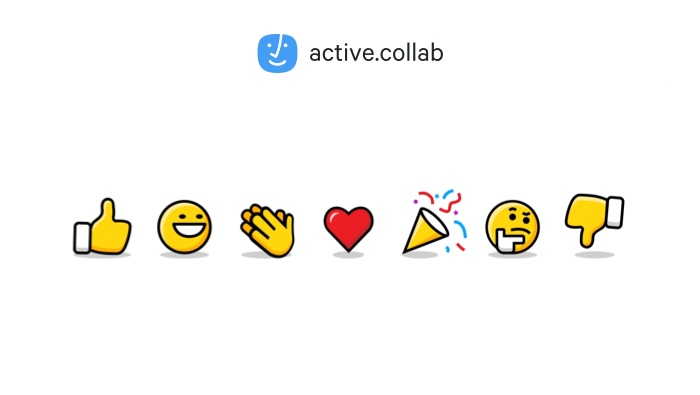 The Reactions are up and running in ActiveCollab 5.15.0! We are bringing you a new way to make your day-to-day communication more expressive and engaging. Not all comments are created equal. More often than not, all you really need to do is give a thumbs up to a good idea your teammate just posted or give a simple feedback on a proposal you’re discussing. Imagine the whole team voting yes or no on a new design concept. That’s an awful lot of comments and a needlessly long discussion thread. That’s why you probably didn’t have these sort of discussions in ActiveCollab, and we completely understand that. But with our new Reactions, and the efficiency they’re bringing to the table, you are now a step closer to keeping all important communication under one roof. You’ll be able to choose one of the Reactions (or more if you’re feeling like it) and your teammates will receive a notification in their Updates section. Hooray, your comment just received a couple of party poppers! Additionally, you can check who took part in the celebration by hovering over the Reactions. ActiveCollab Reactions can be used for a couple of handy things, other than the ones that were mentioned. We'll be writing more about that in the coming weeks so stay tuned. If you want to learn more about the logic behind our reaction feature, we advise you to read the “under the hood” article which can be found on this link.